ACC screwdrivers are 110V direct plug-in tools with built-in PCB for automatic power cut-off and AC-to-DC rectifier. No separate control unit is required. The ACC is the perfect screwdriver for multiple workspace applications. The FAB03SS (Soft Stop) has a specially modified CAM in the clutch to limit the impact in the clutch when it reaches the predefined torque setting. This makes the FAB03SS the right tool for shock sensitive application like hard drive assembly. The FAB03SS is available in an in-line body style only. 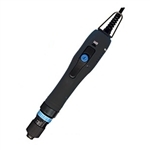 The FAB series electric screwdrivers are our best sellers for the electronic industry. Their advanced ergonomic design, ease of use, high accuracy, and durability have made these drivers the standard by which all others are measured. They are lightweight, compact, powerful and come standard with ESD-safe housing certified to SP method 2472 (Ericsson approved). The torque is set externally: an adjusting nut controls output torque by changing the clutch spring compression. A reference scale will indicate the torque setting. The low voltage 30 VDC rare earth motor combines high performance and long life. Replacing the carbon brushes once a year is all you need for maintenance. The motor works in combination with a control unit. The electronic control circuit cuts the power supply to the motor in response to the clutch action as soon as the pre-set torque has been reached. NOTE: The heavy duty cables and connectors, developed for robotic applications, are made of antistatic dissipative material for a safe use in ESD environment. The FAB12RE/FR is our best selling screwdriver due to its wide torque range and ergonomic ESD safe in-line body style. This tool is supplied in an ergonomic ESD safe in-line body style. The tools offer ease of use, have high accuracy, and durability. They are lightweight (about 1 lb), compact, powerful, and come standard with ESD-safe housing certified to SP method 2472 (Ericsson approved). The adjustable RPMs and slow-start options make it a versatile tool ideal for multiple applications. The low voltage 30 VDC rare earth motor combines high performance and long life. Replacing the carbon brushes once a year is all you need for maintenance. The motor works in combination with a control unit. The electronic control circuit cuts the power supply to the motor in response to the clutch action, as soon as the pre-set torque has been reached. A Controller is required for this tool to operate (purchased separately). The EDU1FR is our most popular controller because of the RMP control it provides. The EDU1FR/SG offers the same functionality with the addition of an input for remote start and outputs for lever start (motor on) and clutch fired (motor stop). The EDU1CL/FR is the same shape and size but offers no RPM control (this is our lowest cost model). The EDU1FR/PLC offers screw counting and has IO available to control secondary operations. NOTE: The heavy-duty cables and connectors, developed for robotic applications, are made of antistatic dissipative material for a safe use in ESD environment. The RAF32NS/FR is our most popular RAF series screwdriver due to its wide torque range and ergonomic ESD safe in-line body style. RAF32 Series screwdrivers are designed to meet higher torque applications than the RAF12 family of tools. The advanced ergonomic body design reduces Carpal Tunnel Syndrome. They are lightweight, compact, powerful, and come standard with ESD-safe housing certified to SP method 2472 (Ericsson approved). The RAF series wide torque range and tight torque accuracy, combined with the adjustable RPMs and slow-start options, make it a versatile tool ideal for multiple applications. The motor works in combination with a control unit. The electronic control circuit cuts the power supply to the motor, in response to the clutch action, as soon as the pre-set torque has been reached. A Controller is required for this tool to operate (purchased separately). The EDU1FR is our most popular controller, because of the RMP control it provides. The EDU1FR/SG offers the same functionality with the addition of an input for remote start and outputs for lever start (motor on) and clutch fired (motor stop). The EDU1CL/FR is the same shape and size but offers no RPM control (this is our lowest cost model). The EDU1FR/PLC offers screw counting and has IO available to control secondary operations. The Brushless CA screwdrivers are designed for automated and fixtured applications. Special wiring and dedicated controllers are equipped with electric signals and contacts for immediate and easy interface. The ideal alternative to pneumatic drivers, they feature a long life maintenance free electric motor with a unique electronic control system for high accuracy throughout a wide torque range. 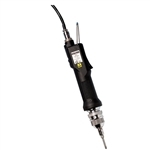 The Brushless CA screwdrivers are designed for automated and fixtured applications. Special wiring and dedicated controllers are equipped with electric signals and contacts for immediate and easy interface.